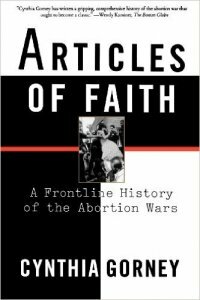 Nominated for the Los Angeles Times Book Prize, Articles of Faith is a powerful exploration of one of the most divisive issues in our recent political history, and the only book to portray the passion of both sides of the abortion conflict. 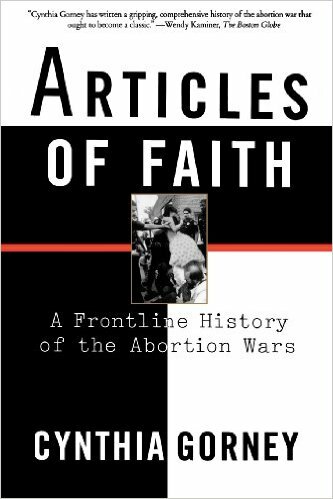 Drawing from more than five hundred interviews as well as previously unseen archival material, Cynthia Gorney has written a compelling narrative that explores the years between Roe v. Wade (1973) and William L. Webster v. Reproductive Health Services (1989), the first case to challenge the Roe decision before an anti-Roe court. Meet Judith Widdicombe, the registered nurse who runs the abortion underground in 1960s St. Louis and then the first legal clinic after Roe v. Wade. And meet Samuel Lee, a young pacifist and would-be seminarian whose provocative abortion bill becomes the centerpiece of William L. Webster v. Reproductive Health Services. The Supreme Court case brings the two advocates head-to-head.